We have 100,000 copies to give away with Bundle Stars. Update: This is your last chance to grab a key before the giveaway concludes on Wednesday July 20! 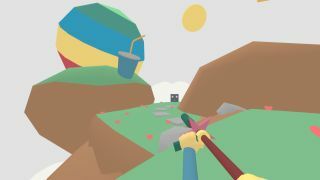 High speed 3D platforming and precision shooting collide in the sugary pastel worlds of Lovely Planet, a game we gave a score of 82 in our review. Tyler loved the merciless nature of the game's many levels saying "its rapid repetition training can be grueling, but learning, succeeding, then mastering its trick jumps and perfect projectile slinging is heavenly." Would you like a free Steam key so you can play it yourself? We've teamed up with Bundle Stars to give away 100,000 copies as we await tinyBuild's incoming Lovely Planet Arcade, which is out on July 22. To enter, simply follow the instructions in the widget below. Meanwhile, Bundle Stars is celebrating with the launch of the Indie Legends 4 bundle, which includes the quality tactical SWAT tactics game Door Kickers, as well as tinyBuild's stealth strategy game, Party Hard, and the atmospheric survival stealth game Sir, You Are Being Hunted.